However this can take a long time since going to logic zero will take time, an easier way to detect input is simply by measure the voltage across it, after you have given it a short time to discharge. What this will give you is capacitive charge held by LED, you can use this to determine whether an input was created or not.The LED is not an ideal device, that is, not all of the discharge is caused by photons, other causes include thermal noise and leakage. So given enough time the charge will decay without any light. 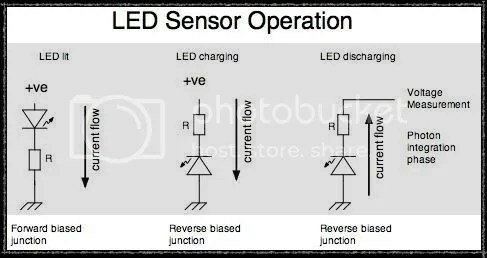 Finally, since LEDs are not designed to be used as light sensors, the light sensing ability varies from LED to LED. There are some types that are better than others. I’ve found Red LEDs are the best as they will be sensitive to more colours of light where as blue LEDs will be sensitive to only blue light. Worst of all are white and IR LEDs most dont work effectivly to obtain any significant reading. The junction size is also important so the smaller an LED is the more sensitive it will be as the capacitance is smaller and it takes less photons to discharge it. Finally a clear package will let more light in than a coloured one. If you want to use LED light sensors as touch sensors then surface mount LEDs are probably best, since they have a wider FOV and are in a clear package. You are currently reading LED Sensing ~ Bi-Directional LEDs – Part 2 at Interactive IO & More.